The Icon of the Mother of God, named "Prosperess of Loaves" ("Sporitel'nitsa Khlebov"), was written at the blessing of the starets-elder of the Visitation Optina wilderness monastery, the priest-schemamonk Amvrosii (Ambrosii) (23/XI/1812 - 10/X/1891). Father Amvrosii, a great Russian ascetic of the XIX Century, was ardent with a childlike faith towards the Mother of God. He in particular revered all the feastdays of the Mother of God and on these days he redoubled his prayer. With the icon, "Prosperess of Loaves", Father Amvrosii blessed the Shamordinsk women's monastery established in honour of the Kazan Icon of the Mother of God, and founded by him not far from the Optina monastery. 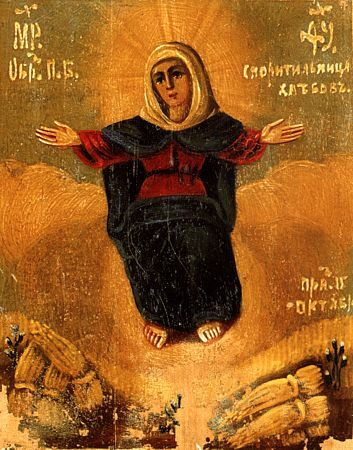 On this icon the Mother of God is depicted sitting upon the clouds, and Her hands are extended in blessing. Beneathe – is a compressed field, and on it amidst the grass and flowers stand and lay sheaves of rye. Starets Amvrosii himself decreed the day of celebration – 15 October, and called the image "Prosperess of Loaves", indicating by this, that the MostHoly Mother of God – "is an Helper for people in their labours for the acquiring of their daily bread". Before his blessed death, Father Amvrosii ordered a large quantity of photo-replicas of this icon and distributed and sent them off to his spiritual children. For the singing of an akathist before the holy image, the starets composed a particular response: "Hail, Thou Full-of-Grace, the Lord is with Thee! Grant unto us unworthy ones the dew of Thy grace and the showing forth of Thine mercy!" The day of burial of Father Amvrosii happened on 15 October – the feastday of the icon. The first miracle from the holy icon was witnessed in 1891, when throughout Russia was a famine because of crop-failure, but in the Kaluzh district and on the fields of the Shamordinsk monastery grain was produced. In 1892, already after the death of Father Amvrosii, his attendant Ivan Feodorovich Cherepanov sent a copy from the icon to the Pyatnitsk women's monastery in Voronezh district. In this locale there was a drought and famine threatened, but soon after a molieben served before the icon, "Prosperess of Loaves", it rained and ended the drought.